clocks and diagonal clocks too. We are learning math and money like how much money. Third grade is the best grade ever. Third grade is doing absolutely great. This is what I’m going to wear for Book Character Day. I’m going to be a witch in the book of the witches and for Halloween I’m going to get a cat costume for Halloween. Next Halloween I’m going to be a Rabbit or a Tiger. I’m am going to go trick or treating my brothers and sister and my grandma’s daughter. This is what I’m going to do for the weekend. I’m going to my grandma’s house. And my uncles’ house. My mom said we might go swimming or somewhere else. When I get home I’m going to ride my bike. Before we go we might be going to go to the playground or the other playground. We will have fun. Today I saw obama on T.V. He was doing a speech. I saw his wife and kids. When I saw him on T.V he wasn’t crying the audience were crying, except his wife and kids. And a guy asked the kids questions. Then the guy said what would you do if your dad voted for McCain? They said I don’t know. This is what’s on my mind today. I’m thinking about my weekend. What I’m going to do on my weekend on Friday. I’m think my mom said that when we come from school we go in the car we go to Kent then we go to my grammas’ house and my dad is going to visit his sister and brother and on Monday he brings us home. Then the next day it’s school. I like report cards because sometimes you might be doing good in school and some times bad. I like report cards because I like to be nice in school. I like report cards because you might get a better grade. You might get an award . Report cards are like getting a higher grade and if you read their jokes they are funny. Once upon a time there lived a turkey. She was small. Her name was Donna. She grew 15 inches every single day. When she grew 55 inches there was a man that tried to get her except Donna ran fast. Finally when the man caught another turkey but they wanted 1000 turkeys, Donna got tired. She rested. When she got up she was at a boiling store. Where they cut turkeys in medium small pieces Donna pushed the man with her beak. She ran and she found a safe place. She made new friends. Her friends were a rabbit and a Mole and a Bird. If it snows tomorrow I will be happy and I’m going sledding. How they know its going to snow, maybe they saw it on the news. I will read more books because my brain is forgetting everything. I will help my mom because my Mom is tired every time. I will watch less TV because my eyes get blurry. I will remember to bring it to school because I forget. I will do what my teacher says. Because if I don’t I'll know nothing. I will hold my new baby sister while my mother works because I just like to. I will do what mom tells me to do because I forget for a while. Won’t whistle at home because I learned it and then I started. I will sleep when my family says to because at school I sleep sometimes. 1. The inauguration was exciting and fun to watch. 2. And Obama is now moving to the white house. 3. I also saw Bill Clinton on TV. 4. And I saw the white house. 6. George W. Bush was on a helicopter moving. 7. And I saw the parade. 8. Obama’s hand was on the bible. 10. My family was watching it last time. 11. And everyone was waiting for this day to come. I’m happy you won, our whole class is happy and there is only 1 person that voted for McCain and a lot of people voted for Joe Biden and he’s the Vice President. We voted for you because you are trying to stop the war and also the other class maybe is thinking something else. My brother didn’t know which one to chose. So this is what he did, he made 6 papers, 3 of the papers said Obama and 3 of them said McCain. He curled them up and told me to throw them at his bed and mixed them up and then he chose one and it was Barack Obama. It was great. I have a dream that one day the world shall be free forever and the war should stop and if you’re mad you should not use weapons like guns, a knife, and other harmful things. Black men and women and white men and women shall be treated the way they want to be treated. Now finally we are going to a field trip and it’s going to be fun and I’m glad and on February 26 we have another field trip to the zoo, and that's so awesome. My plans for the weekend are playing Runescape. It's cool and Friday night Smack down I almost know all the players. I know umaga & undertaker, & edge, Michelle,& Ashley, 619, I think that’s all I can remember, but it's so cool and Runescape. Wasl it’s easy. I think I finished and it was fun! Halfway it took me forever to read it. I don’t know to finish a story almost. I had fun doing that Wasl thing and it was so cool! Today the wasl we did was halfway easy and fun. Wasl stands for Washington assessment of student learning. I think all of the people in the United States did it I think maybe. It was so easy. We had a new test session one. I finished the one for today and it was easy, we had to read, write, plus, takeaway, subtract, I think that’s easy. I halfway liked the wasl (only halfway). It was so easy! Easy as number one it was easier. It took I don’t know how long it took me but it was easier than all of them. It had reading in it and writing and plus takeaway and reading and that’s all. I just think people should just take good care of the Earth and nothing else and don’t cut the trees. If there were no trees we wouldn’t breathe or we would just be sitting there doing nothing and waiting to die! And that would be just stupid I think so I’d rather not cut down trees, and if other people did cut all the trees I would just plant them back or just run maybe or just pick up what people threw on the ground. I hope people take good care of the earth. I hope people would stop cutting down trees. I hope they wouldn’t throw scraps or papers. I hope people would not litter. I hope people take good care of the Earth. 3. What does it mean to you? I don’t exactly know what it means so I’m going to guess all I know is people take good care of it. To me it means people shouldn’t do littering or any of those things. People should not litter or even if they are in a hurry they shouldn’t throw it they should just put it in their pockets and wait until they see a garbage can. I’m just going to clean. 5. And others should just help and no littering! Lulay her or lulay me?? I’m thinking about Summer. I can’t just wait to use the computer. I can't wait to use the computer, help my mom, hold my baby sister (s) and my auntie that has the same name as me is going to have a baby……so I think it's sisters and I cant wait to go to my grandmothers house… it's going to be really F-U-N. My grandmothers daughter said were going to go to….take pictures and were going to this place I never heard. I don’t know the name….but she’s also getting married. Her name is Johora. She’s getting married to Issa, he’s at our house when I was going to the bus stop I saw him in the living room sleeping because the house was full of kids and moms and my grandmother. I love my blog. I also like all the others too. My parents are going to accept about me keeping my blog. I can’t wait to write more. Writing is really fun. Blogs are cool. I love mine. I also worked really hard on my blog writing article. Maybe the goal should be 40-50- maybe even 99 or 100. I worked on my writing and letting people see what I'm doing over the weekends and what’s on my mind or about what I did at snow day. Mr. Ahlness is my 1st boy teacher I never had a boy teacher before. My blog has about 20-19-18-16 blog articles. I think I'll write maybe forever. I will write some more. It's fun writing, really fun writing. I love my own blog, it’s like my own website and also really fun for kids under 8. 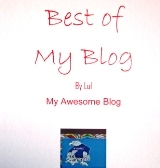 Blogs are really fun when I was new to the school I only had one in there. Now I have a lot in there, like maybe I have 12 or 18 maybe I never even checked only when we were doing Y.A day (Young Authors day). I really want to keep my blog when I'm old enough. I wonder if the teachers went to this school and went to Mr. A’s class and have a blog article. I wonder…if the teachers have a blog like ours. Having blogs are fun. Maybe if YOU read this you should get a blog too. Its fun writing. Everything about blogs is really really really really fun. I love blogs. I’m going to keep mine. I hope whoever is reading this YOU should be having fun with it. Whoever is reading it YOU should be having fun with your blog I think. Have fun with your blog if you are happy or not happy with your blog I think you will be happy will your blog someday….remember blogs are really cool.